View our full variation guide here. Exclusive to retail blaster boxes. Click here for a complete visual guide. Exclusive to hobby and jumbo packs. Click here for a complete visual gallery and guide. Topps Update, Topps Traded--the name doesn't matter so much anymore. It's all about see players in new jerseys using the flagship design. 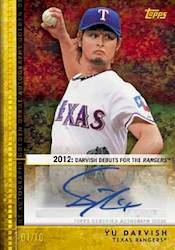 2012 Topps Update Series Baseball offers a bookend to the regular season. It gives set collectors the latest rookies and veterans on new teams, as well as many other highlights. Sticking with a familiar configuration, 36-pack hobby boxes come with the promise of one hit. Jumbo boxes have an autograph and two relics, including one gold-themed commemorative relic. Get a real-time look at the 50 hottest 2012 Topps Update Series Baseball cards currently listed on eBay. The 330-card 2012 Topps Update Series Baseball checklist uses the same design as the two previous 2012 Topps base sets and is filled with subsets. Besides rookies and traded players, every single 2012 All-Star selection is represented. Collectors can also find Home Run Derby cards, five Record Breakers and ten Rookie Debuts. Base cards also ave several parallels, making a challenge for player collectors in particular. Carrying over from previous sets are Golden Moments (1:4 packs) and hobby-exclusive Black cards (#/61). One-of-one parallels include Wood, Platinum and Printing Plates. Numbered to 50, Golden Silk Collection cards also return as a partial parallel set of 100 cards. Many collectors noticed the familiar Gold parallels missing from 2012 Topps Series 1 and Series 2 Baseball. It was particularly odd considering the gold theme that ran through both sets. They're back as a massive 990-card set paralleling every card in all three series. As collectors might expect, each Gold card is numbered to 2012. Gold-themed inserts continue in 2012 Topps Update Series Baseball. Commemorative relics fall one per hobby case and one per jumbo box. New sets include Gold Hall of Fame Plaques. 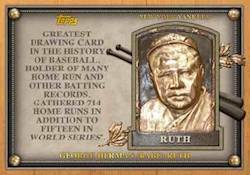 Each of the 15 cards in the set have a replica plaque that resembles the one seen in Cooperstown. The checklist is loaded with players like Mickey Mantle, Babe Ruth, Nolan Ryan and Jackie Robinson, to name a few. Popular ring cards return with Award Winners Gold Rings, which commemorate individual achievements of 15 players. Numbered to the featured player's jersey number, Gold Futures Coin Cards have embedded replica coins designed with the player's face. The five-card checklist includes Bryce Harper, Brett Lawrie, Yoenis Cespedes, JD Martinez and Yu Darvish. One-of-one Solid Gold Futures cards include a piece of real gold. Just four cards are in the set. Finally, Gold Engravings Reprints take classic cards of Hank Aaron, Brooks Robinson and Duke Snider and give them a golden makeover. A trio of inserts series carry over from earlier sets: 1987 Topps Minis (50 cards, 1:2 packs), Golden Greats (25 cards, 1:8 packs) and Golden Moments (50 cards, 1:4 packs). Also carrying over is the 2012 Topps Golden Giveaway program. Online redemption codes are inserted every six packs and may unlock exclusive cards and prizes. 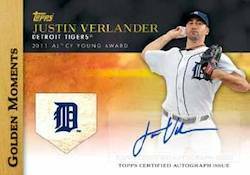 New to 2012 Topps Update Series Baseball is Blockbusters, a 30-card set that looks at some of the biggest trades and free agent signings in baseball history. 2012 Topps Update Series Baseball autographs mirror basic inserts. They include Golden Moments Autographs (25 cards), Blockbusters Autographs (ten cards numbered to 25) and Golden Greats Autographs (ten cards numbered to 10). Rookie autographs are in the Golden Debuts Autographs set. Both the Golden Moments and Golden Debuts Autographs have a Gold parallel limited to ten numbered copies. Both the Blockbusters and Golden Greats sets have a handful of relic versions featuring memorabilia swatches. Blockbusters Relics is a ten-card set (#/50) while the Golden Greats Relics set has 15 cards (#/10). 2012 Topps Update Series Baseball also has a Mickey Mantle Reprint Relic based on his 1969 Topps card. It is appropriately numbered to 69. Autographed memorabilia cards are extremely tough to come by in 2012 Topps Update Series Baseball. Inserted exclusively in hobby and jumbo packs, Blockbuster Autograph Relics and Golden Greats Autograph Relics are limited to just 5 numbered copies. 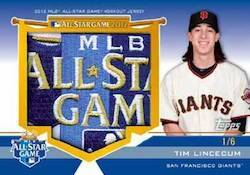 2012 MLB All-Star gear is the focus of several other relic sets. All-Star Stitches uses All-Star workout jerseys from all 55 All-Stars. The cards have two parallels: Gold (#/50) and Platinum (1/1). Fifteen players also have signed versions (#/25). Numbered to 6, All-Star Jumbo Patches has a checklist of 45 players, each with a massive workout jersey patch. There are also ten Autographed All-Star Jumbo Patches that are also numbered to 6. Dual- and triple-swatch cards are limited to 25 copies each. Both sets have ten cards. 2012 Topps Update Blockbusters Commemorative Hat Logo Patch #BP7 Ken Griffey Jr.
Good: New cards of players in new uniforms, super short prints, product is top-heavy with inserts. Bad: Same basic white bordered base card design as 2012 Topps Baseball Series 1 and 2 releases, only one hit per box, autographs are stickers. The Bottom Line: 2012 Topps Baseball Update Series Baseball is a fun, affordable break. It's ideal for set and insert collectors. The opportunity to get some of the first cards of players in new uniforms and late rookie call-ups is always fun. The 2012 Topps Update Series Baseball base card design is crisp. It allows for each team's uniform to stand out, which I throughly enjoy. There are multiple variation short prints to chase. I like the inclusion of these cards that capture the players celebrating or posing in a suit. They also add some solid value, particularly the super short prints. I really enjoy the 1987 Topps mini design. The game-used relics and autographs essentially mirror the inserts. Unfortunately, autographs rely on stickers. The All-Star Game Relics stand out with a high-end design. The All-Star Jumbo Patches and Gold Hall of Fame Plaques, in particular, look amazing. Card designs are a key in the hobby world and Topps once again nails it with this baseball release. This product is comprised of 330 base cards as well as 32 short prints. The base set features players in their new team uniforms, rookies, All-Stars, and players who didn't make it into the first two sets. Bryce Harper, Yu Darvish, and Mike Trout are well represented in various the base cards, inserts, relics, and autographs. This product is ideal for young collectors all the way up to old-school set collectors. As with all base Topps Baseball products, boxes are affordable. While they're extremely tough to pull, high-end hits can bring big returns. And with the lower price point, the risk is also a lot smaller. 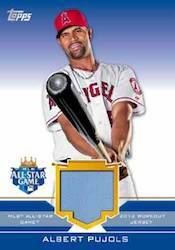 Many collectors get excited about the first cards of a player wearing a new uniform, especially when it's a superstar. That is what makes Topps Update Series such a great product. You don't have to wait until next year's release to add them to your team collection. Every pack yields at least one insert, which is nice. The different card designs presented in this product allows for a fun and inexpensive box experience for nearly all types of collectors. Series 1 and 2 had wrapper redemption cards for 14 jumbo wrappers or (I think) 50 hobby wrappers. I guess that’s not going to be done this time but I haven’t seen anywhere where that is confirmed. Could that be announced earlier next week? FQ (ID 64210) � It’s possible. We haven’t heard anything about a possible wrapper redemption yet. We’ll certainly post about it if anything comes up. Awesome – thanks for posting! Really hoping for the wrapper redemption. I pulled a Matt Kemp SP and a Mitt Romney West Viginia PPR-48 out of a retail box from Walmart today. It is a nice product. 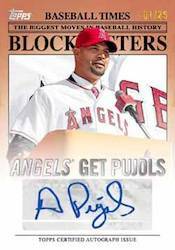 I got a blaster box from Wal MArt today and got an Albert Pujols Blockbusters patch. I have this posted on eBay under my name, Sterkinator. It is brand new. I got two jumbo boxes the other day and pulled a Berra and Mantley Plaque card (1 in each box). This truly is a great product. I’ve gotten several of the hanger boxes and have done reasonably well- no hits, but several SP’s. I bought the Bench plaque card on eBay and it is a fantastic card! Been out of the baseball card collecting since 1997 and jumped back in today with a blaster box from Walmart. As always my standby brand Topps did not disappoint. Had two packs of blue parallel and blockbuster patch of John Smoltz, one of my favs when I was younger. Thumbs up! Oh how I’ve missed this! GREAT SET HAVE MULTIPLE HITS, SP’S, AND AT LEAST 15 OF EA. CARD SERIES 1,2,& UPD. IF ANYONE IS LOOKING FOR ANY CARDS EMAIL YOUR WANT LIST AND ILL BE HAPY TO HELP! (CCAMASSO AT GMAIL DOT COM) …ALSO CAN ANYONE TELL ME WHAT HAPPENS IF THE PRESIDENT WINS THE STATE LISTED ON MY CARDS AND THE ODDS IF ANY FOR WINNING SOMETHING IF THEY DO OR DO YOU AUTOMATICALLY GET SOMETHING? corey camasso (ID 87762) � I believe with the Presidential predictors, it will still be tough to win. You enter the code on the card. Everyone who enters the winning candidate for a particular state is entered in a draw, one winner per state. Favorite set of the year. Easily spent the most I’ve ever spent on any product buying HTC jumbo boxes. From the HOF Plaques, Rings, and hat patches to the attractively designed all star jersey relics. Disappointed no wrapper redemption but had fun and still organizing my stacks and stacks of this stuff. Only reason I’m giving topps update a 4 is because hobby boxes only yield 1 hit per box. I got a jumbo box and a hobby box when update released, and I have to say that I should have just got another jumbo box. Quality of cards are great, I like the golden moments inserts and the mini’s, both have a variety of players in the set. It would be great for younger collectors who can only buy hobby packs/boxes to have a chance at two hits in hobby. Two hits per hobby box, either an auto. or relic would be great for the younger crowd with limited resources for cards. I always look forward to the update series for traded players in their new uniforms. I think there are way too many inserts though. It would be pretty tough to complete a set of everything. Pleased with the set and return of #d inserts. Long for days of easily collated update sets..this ain’t easy. 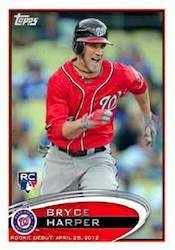 2012 Topps Update Baseball Hobby Jumbo Box Of 10 Packs 50 Cards Per Pack Harper!